Question: What was the hike like? You literally hike lodge to lodge, carrying only what you need during the day like a jacket, water, snacks, etc. 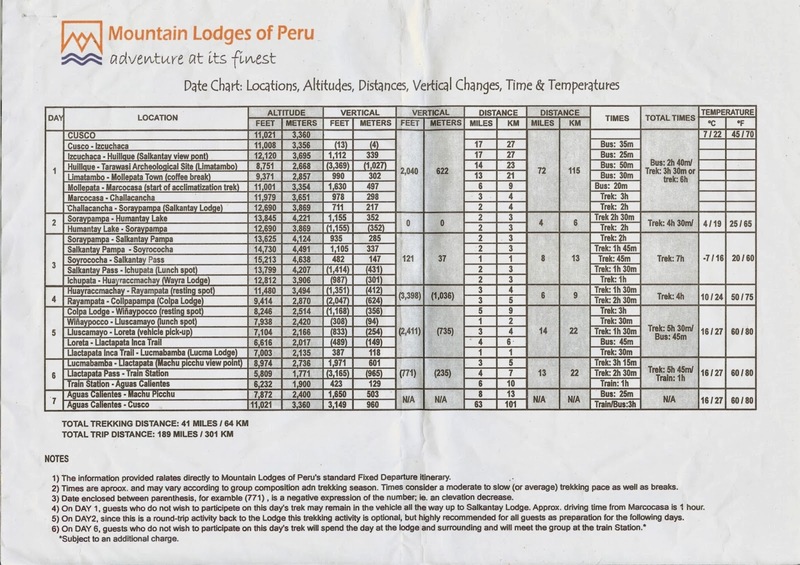 See the Mountain Lodges of Peru Distance Chart (shown in this post) for distances. Note that since conditions are variable, routes may change tour group to tour group. In our case, one path was considered too dangerous (due to water) and we took a different path for part of a day. Question: Was the hiking tough? In general, no. There were a few sweaty parts. In particular, getting over the Salcantay pass and climbing Wayna Picchu. To be sure, we were happily tired at the end of the day. Yes, you need to be in good shape, but, with a little training (even if you are a sea-level inhabitant) you probably will do fine. Question: Why the Salcantay route? Because the popular way for walking to Machu Picchu (the Classic Inca Trail) can be overcrowded. In contrast, the Salcantay route offers a more relaxed way to get to Machu Picchu, with fewer people. For example, we saw just a handful of other people on the trail and we definitely felt we weren’t hiking with the masses (which might be your preference, but not ours). 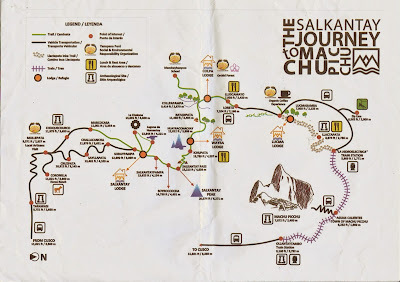 Also, as of the time we went, there was no charge for using the Salcantay route; there may be in the future, we heard. Another good reason to take the Salcantay route and use the Mountain Lodges of Peru (MLP), is that MLP helps the community by employing local people and creating organizations to empower people, like Yanapana Peru. It feels like our money made a small difference and our impact for going there was lessened (but I could be just deluding myself). Finally, what’s not to like about staying in a nice lodge (nice rooms, hot shower) in the middle of beautiful scenery? On the downside, the Salcantay route does not take you by as many “ruins”. We feel like this wasn’t a big downside at all, but, depending on what you are hoping to see, keep this in mind. Question: What about altitude sickness? Altitude sickness is referred to locally as soroche. Merriam-Webster indicates that it comes from Quechua surúchi, “the belief that the sickness is due to the presence of the metal in the Andes Mountains.” The site Blog de Redacción gives a more credible answer which can be traced to the silver mining during the time of the viceroyalty (1542 – 1824). For altitude sickness, we did not take any drugs (like Diamox) as a few in our group did. We just took aspirin and followed the general instructions for drinking lots of water and going easy on the alcohol. Deep breathing seemed to help as well. Everyday altitude sickness symptoms for us were mild headache, shortness of breath, and general fatigue. Despite the symptoms, altitude sickness never kept us from hiking (nor anybody else in our group). We each seemed to experience altitude sickness symptoms as slightly different times. 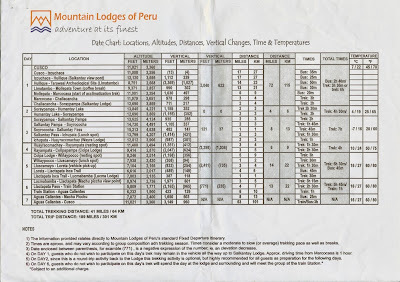 For example, one of us really felt it in Cusco (11,200 feet), and the other at Salcantay Lodge Soraypampa (12,705 feet). Be prepared for some times when you might feel nauseous and have a lessened appetite for part of a day. Coca leaves and tea (while nice, especially the tea) didn’t seem to make a difference for us in terms of altitude sickness. In fact, we preferred the muña tea over the coca tea. Be prepared for nights where you will not sleep well because of altitude sickness. Question: Any problems with the water? No. The hotels (and MLP) we were in always had drinkable water available, whether in pitchers in our rooms or in big water dispensers in common areas. We were not short on drinkable water at any time. And, while hiking, a porter carried extra water. Question: What was the weather like? We were there at the end of December, which falls in the rainy season for Peru. We had some gorgeous sunny days and some gray, rainy days. Yes, it did rain on us, but it wasn’t horrible. The weather never stopped our enjoyment, but of course we weren’t camping outside. Most of the rain was really misty or a drizzle. We wore ponchos; others in our group had rain jackets. We thought the ponchos were good for keeping our cameras dry, yet having quick access to them. The ponchos also seem to allow more air through them to keep you cool, if you are prone to getting hot easily. The downside of ponchos is you can look like a fluttering big blob. Question: What should you pack? Bring lots of sun protection (cream, hat, and glasses). We didn’t once use the insect repellent we brought. Others in our group said they were bitten. It’s best to bring some and play it by ear as whether to use it. Trekking poles? Most of the people in our group used them at one time or another. We did not even bring them. In retrospect, I might have packed one pair for both of us, because there were a few times when an extra point of balance would have been nice, and we could each grab a pole. Shoes. At a minimum, you just need your boots. When you get back to the lodge, if you want to walk around in something else then bring sandals or a light pair of shoes. Question: What was the guide situation like? We had one lead guide all of the time, a secondary guide most of the time, and various porters and helpers along the way. I believe at the point we crossed over Salcantay pass (Abra Salcantay), we had our two guides, a chef and her assistant, five mule drivers, and 13 mules. At that point, roads could not be used to transport our luggage to the next lodge. In terms of tipping, we had one person in our group collect the tips for each guide, combine it all, and hand it over. The REI tipping information is what we followed. Question: What was the highlight of the trip? Two things. 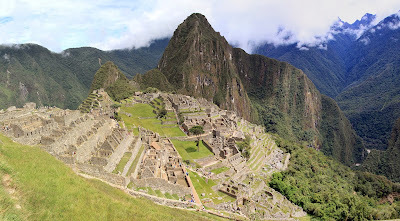 Of course, Machu Picchu and all that entails. We spent two full days there. But also a highlight for us was the journey to Machu Picchu, walking together in a group and getting a sense of the places we were walking through. In fact, there is a bit of a transition as you go from the peaceful days of walking to the throngs of people at Machu Picchu. Our REI tour guide helped shield us from the throngs and whisked us through lines and away from the other sweaty masses. Question: Was climbing Wayna Picchu worth it? Huayna Picchu or Wayna Picchu is the peak next to Machu Picchu. There are good views of Machu Picchu from Wayna Picchu, and, if you can stop focusing on the sweat pouring out of you, you can really admire the Inca engineering that went into the path that takes you to the top of Wayna Picchu. I am spooked by heights and I managed to make it up, with a little difficulty. Actually, the real difficulty (as typical of these situations) was coming down the top half of the peak where the stairs were narrow, had little to hold on to, and seemed to drop off into nowhere. If you are afraid of heights, you can go half way up and there is a turn-around point. There seemed to be guide cables for this first half of the climb and the turnaround point was fairly well-marked. Question: Did you eat guinea pig and what did it taste like? We had Guinea pig (Cavia procellus), called cuy locally, a few times. To us, it tasted like rabbit. It was always presented as something optional we could try, so don’t feel like that’s all there is to eat. There are plenty of other interesting things to sample. Question: Anything you would do differently? Our tour (and many others) start and end in Cusco. We spent about a day in Cusco before our tour group officially assembled. I would have liked an extra day or two more to explore Cusco before the tour started. Also, the first day with our group was spent in Cusco touring the sites. Ask which sites you’ll see with the tour so you don’t visit them twice. Another thing I would have done is spent more time in the Sacred Valley before or after the tour. After the tour arrived back at Cusco, we left the next morning to spend 3 days in Lima. I don’t regret the three days in Lima, but would have liked more time exploring the Sacred Valley. So, if you are there and have the time, stay and explore.